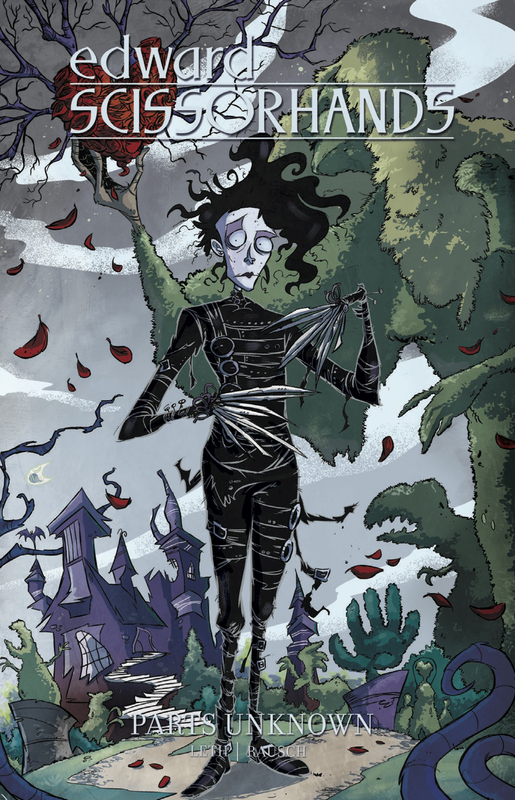 Edward Scissorhands has to be one of my favourite Tim Burton characters/movies of all time, so when I was browsing through NetGalley and saw that there was a graphic novel coming out soon I was beyond excited. I have a new found love for graphic novels and mashing that up with one of my favourite movie characters of all time was the perfect mix to capture my attention. At first glance I thought that this graphic novel was going to be a straight retelling of the film, but instead to my surprise it was a sequel. I tend to be a little iffy about sequels after such a long period of time after the initial release of a movie, but I figured because it was in the format of a graphic novel I would give it a go. This story introduces the audience to a new character named Meg who turns out to be the granddaughter of Kim, the character from the film portrayed by Winona Ryder. Kim has recently passed away leaving Meg with all kinds of unanswered questions about the mysterious man who lives in the castle on top of the hill that has been accused of murder. Meanwhile, Edward has been living in the castle alone for endless years as he is no longer welcome in the city due to event that took place in the film. While rummaging through the castle he stumbles along another creation by the same man who created him, only to find out that this creation is missing a vital piece. I love that the story kept it’s ties to Kim and her family. It wouldn’t be the same without some mention of her character. I love that it stayed true to the character of Edward. In the film he is very soft spoken, innocent and shy. He is obviously also very misunderstood. The dialogue between Edward and Meg was great with her doing most of the talking and his response being no more than a sentence. The illustrations were also pretty great, some frames were a bit hectic and hard to understand for me, but for the most part it felt very much like Tim Burton. I loved the idea of being able to see what happened after the events of the film. However, as I did like a lot of things there were a few things that I did not. The introduction of a new character/creation kind of bothered me. Edward has been up in that castle for decades and he’s never found him until now? Also, his character design wasn’t really doing it for me either. While the illustrations in this novel felt very “Burton-esque”, to me this new character didn’t feel like he was designed by the same person. Also, the ending felt a little rushed and forced. One minute there is a riot and the next everything is completely calm and okay. Overall, I did enjoy this story. Like I said, I’m a huge Burton fan and more specifically a huge Edward Scissorhands fan, so being able to see a new story unfold was exciting and fun! I would love to own a hard copy of this graphic novel in the future! Thank you to NetGalley for supplying a free e-copy for an honest review! Previous Post Most Anticipated March New Releases! !